Ian left Liverpool in 1969 at the age of 19 to hitch-hike to India on his own, he did fencing jobs and saved up £70 for his trip. The journey look him a month to complete. When he arrived in Delhi the first thing he did was go to the Indian Coffee House and have some Chai, he then hitch-hiked to Nepal and went to the Monkey Temple – what he did for the remaining 5 months we’ve never really been told, he just says he ‘explored’ still living off the £70 he earn’t in Liverpool, then he hitch-hiked back home. He didn’t return to India for 5 years, then when he did he had saved up enough to get a bus across land from England to India – the bus took quite a while though and he didn’t think it would ever reach India, so he decided to leave the bus and people he was traveling with whilst going through Turkey to hitch-hike the rest of the way. At the time there was a war going on in Turkey and the whole city was blacked out. He was one of the first westerners to trek through Zanskar which is in a hidden valley through Ladakh and Kashmir, it had just been opened up, there were no maps available so he had to follow rivers and go across glaciers. 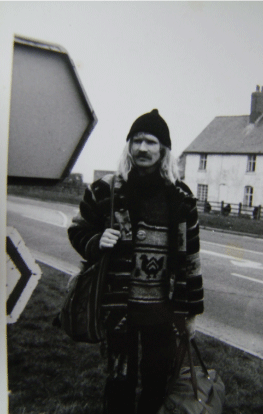 It took him 15 days to walk the 500 miles through the valley. He arrived India and decided to study the Tabla (Indian drums) for two years, whilst living with an Indian family in Varanassi and getting more and more involved in the culture. When he returned to England he brought with him a lot of Indian wares which he sold on markets in Portobello road and markets in Wales and Liverpool. He then went back again and again until he had to open a shop, and the another shop, and then another shop, and then, due to his hoarding issues, it became a wholesale business as well! Jakki first met Ian in 1986 when she was 22 and he was 36 whilst she was working as an accountant for Laura Ashley in the same town as one of Ian’s shops, she saw him out on the market selling his wares and thought he was a very strange and mysterious hippy who wore the most amazing clothes! 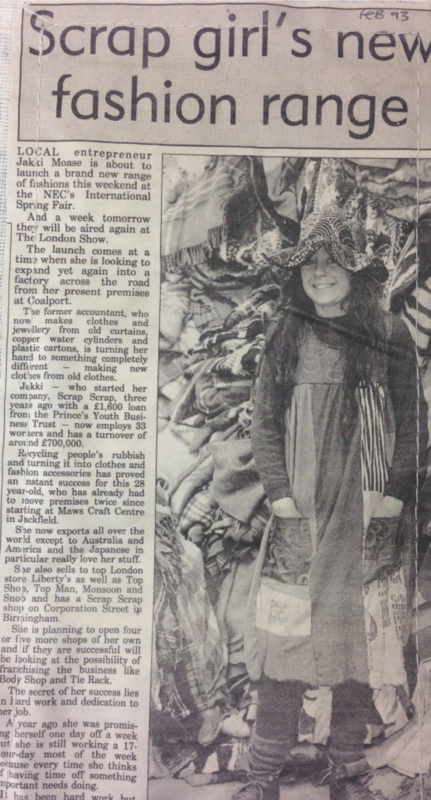 In 1989 Jakki left her job in the town to set up her own textile recycling business called Scrap Scrap. Whilst exhibiting her range for the first time at a local craft centre, Ian and Jakki’s paths crossed once again, this was the first time they properly met and he told her that her business wouldn’t work. However he liked Jakki so soon started to order products from her to sell in his shops – she ran Scrap Scrap for 5 years and in that time it became a very successful business, she had her collection in Liberty, Harrods, Barneys in New York, Lane & Crawford in Hong Kong and had concessions in 8 Topshop stores, all whilst living in a house made out of pallets in her factory in lronbridge Shropshire and employing 40+ machinists & artisans. She continued to supply Ian with her goods for about 4 years after they first met. He used to place small orders and always took a long time so she dreaded him arriving on her tradeshow stand but he compensated for this by bringing the young 20 something Jakki, samosa’s and other little food parcels! Jakki closed Scrap Scarp in 1994 at the age of 30 because the grunge look was going over, she had ran out of ideas and felt the business had ran its course, 5 years of absolute madness, wildly exciting times and non-stop hard work was over. 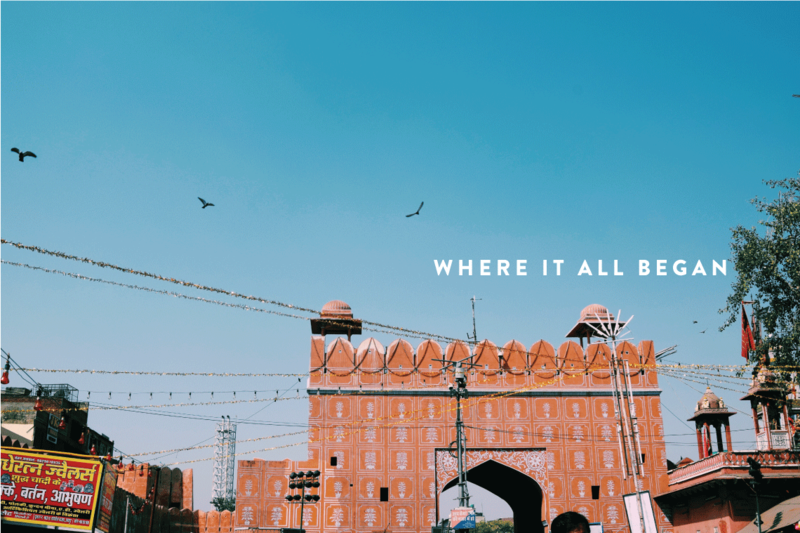 Jakki and Ian were together by this time and a trip to India was on the cards, she soon became pregnant with Daisy, and when back from India, turned her attention to Ian’s business to try and get some shape on things – with a newborn baby! They decided to try selling his dead stock at festivals and for 4 years the three of them spent most of their time on the road living in a tiny caravan. When not travelling they lived in Carno, Mid Wales, central to the shops before moving to Devon in 1999 to be closer to Jakki’s mum and dad. By now they had their second child – India & they bought a farm to run the wholesale business from, leaving the retail shops in Wales. Jakki took over running the wholesale side of the business leaving Ian (who is still a bit of a wandering hippy) to run his two retail shops.